My Super Secret - ZineWiki - the history and culture of zines, independent media and the small press. 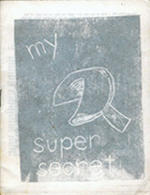 My Super Secret is a zine by Nikki McClure, published in Olympia, Washington, U.S.A..
"During 1990-1991 a list of men who date-raped was kept on the wall of the 3rd stall, 2nd floor of the Library Building at Evergreen State College, Olympia, Washington. This is the story of what happened, or could have." The story describes a world of secret messages passed from girl to girl, as each one navigates a terrain in which they are alternately invisible, constantly watched, or reduced to body parts, and are trying to become whole and integral again. All the while a dance is taking place. At the same time, the author is plotting a secret revolution that begins now, because, "we cannot wait for you any longer." The zine has a silver-printed cover and is illustrated with fortune cookie messages and lithographed illustrations of spiders taken from a book from the early 1900's. On the back is pasted a real fortune cookie message. This page was last modified on 29 November 2015, at 20:12.